If your home is losing that all important kerb appeal because of DIY and builders waste, don’t despair! Help is at hand. We supply builders waste removal Whitechapel building contractors and homeowners can rely on for flexibility, service and competitive pricing. As fully licenced waste carriers, our clients can sleep easy. 80% of the waste we collect is recycled or reused. And anything else will be properly disposed of too. We’ll even use our own dust sheets when we visit, and give the place a clean and tidy before we leave too! When you call, we’ll give you a two hour time slot in which to expect our visit. We work seven days a week, from 7am till 11.30pm right across the Whitechapel E1 area, so there’s bound to be a time to suit. Then, in the hour before we’re due to arrive, one of our team will call ahead to let you know when to expect us. We offer a free, no obligation estimate. 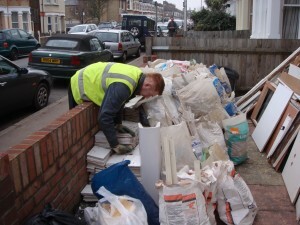 This is inclusive of all labour, transportation and disposal fees for our DIY and builders waste disposal service. It will only take into account the space your waste will use in our truck. And you’ll be pleased to know our rates are among the lowest on the market. 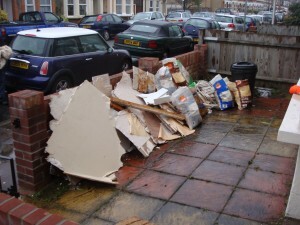 For more information about builders waste removal Whitechapel or to book a collection give us a call on 0208 504 7390 or 07957 123019. Or alternatively you can use our simple online enquiry form to get a quick and easy quote.